[S190] Index - GRO and Office of National Statistics, England & Wales Civil Registration Qtrly Indexes, Birth: District of Thanet, Vol 2a, p702, 3Q1864, mother's maiden name ROWLEY. [S430] Census - 31 Mar 1901, UK census, ED 36 RG13-828 Folio 167 p24. [S687] Census - 2 Apr 1911, UK census, RG14PN4503 RG78PN186 RD63 SD3 ED1 SN216. [S190] Index - GRO and Office of National Statistics, England & Wales Civil Registration Qtrly Indexes, Death: District of Maidstone, Vol 2a, p843, 3Q1913, aged 48. [S896] Newspaper - Adelaide Chronicle, issue of 20 Mar 1930, Vol LXXII, no. 3835, p39, Births. [S769] Newspaper - Adelaide Advertiser, issue of 21 Mar 1950, Vol 92, no.28532, p18, Forthcoming Marriages. [S902] Albany Cemetery Board database, at http://www.albanycemeteryboard.com.au/index.php, aged 76. [S769] Newspaper - Adelaide Advertiser, issue of 6, 7 and 21 June 2017, Deaths & Tribute Notices. [S182] CD - England & Wales burials, National Burial Index V3, at age of 10 weeks. [S667] England & Wales Non-Conformist & Non-Parochial Registers 1567-1970, at http://www.ancestry.co.uk, England & Wales Non-Conformist Record Indexes (RG4-8) gives date of 20th. He was widowed at age 45 on the death of his wife Mary in February 1831. [S390] Book - S Forsaith, Samuel Forsaith Commonplace book. 525. Thomas Forsaith. 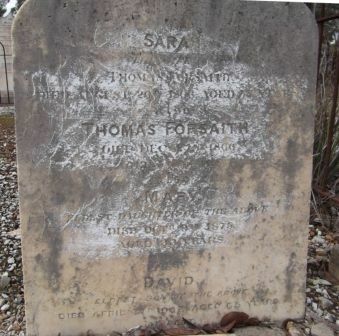 Son of Samuel Forsaith and of Sarah his Wife, of the Parish of Braintree in the County of Essex (born on the Twelfth Day of July 1785) was baptized on the Ninth Day of September 1785 by ye Revd Thomas Davidson. 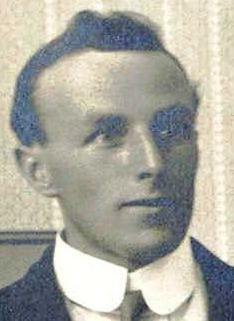 Registered By me John Thorowgood Protestant Dissenting Minister. [S189] International Genealogical Index (IGI), Batch No. M022322, Source Call No. 0374344. [S353] Electronic Files - Pallot's Marriage Index, by Institute of Heraldic and Genealogical Studies, note that church is claimed to be St Ann Blackfriars. [S458] Will - John Forsaith. [S343] Will - Elizabeth Forsaith, UK PRO prob11/1695 image 154. [S349] Will - Samuel Forsaith, UK PRO ref prob11/1695/376. "This is to certify and declare, that Martha, the Daughter of Thomas Forsaith Linen Draper of Camberwell in the County of Surrey and Mary Newell his wife (who was the daughter of William Brown of Shoreditch in the County of Middlesex Butcher) was born at the house of the said Thos Forsaith No.7 in High Street in Camberwell in the County of Surrey on the Seventh day of April 1822. * Mother Dead ) abovenamed. We certify and declare that we were present at the Birth of the Child above-mentioned, and that such Birth took place at the time and place aforesaid. Received, Filed, and Registered, according to the custom in use among Protestant Dissenters, at the Registry of Births kept at Dr. William's Library, Red-Cross Street, Cripplegate, London, this 27th day of June 1837. By me, Richard Logan, Registrar." [S190] Index - GRO and Office of National Statistics, England & Wales Civil Registration Qtrly Indexes, Birth: District of Bethnal Green, Vol 1c, p235, 4Q1878, mother's maiden name DOBSON. [S430] Census - 31 Mar 1901, UK census, ED 20 RG 13-232 Folio 52 p20-21. [S687] Census - 2 Apr 1911, UK census, RG14PN3517 RG78PN131 RD40 SD2 ED20 SN176. [S190] Index - GRO and Office of National Statistics, England & Wales Civil Registration Qtrly Indexes, Marriage: District of Kingston, Vol 2a, p1064. [S954] Website - Anglican Parish Registers, at http://www.ancestry.com/, Woking, Surrey, England: Surrey History Centre, Ref No. 3046/1/20. [S190] Index - GRO and Office of National Statistics, England & Wales Civil Registration Qtrly Indexes, Death: District of Kingston, Vol 2a, p489. [S192] CD - Extracts from Dr Williams Library, British Vital Records CD, FHL No. 816000, note 1108 and FHL No. 838733. [S189] International Genealogical Index (IGI), Batch C097671, Source Call 0825328, (RG4 4207), Items 12-13, Church Records of Poultry Street Independent Chapel, 1701-1836, p22. Thomas Son of Thomas Forsaith and Mary Newell his Wife, of the Parish of the Old Artillery Ground in the City of London (born on the Twelfth Day of January 1812) was baptized on the Twenty Second Day of March 1812. By me John Clayton Protestant Dissenting Minister. [S366] CD - Sth Australian Deaths, Sth Aust Index of Deaths 1842-1915, Book 18, p370. [S775] West Terrace (SA) Cemetery database, at http://www.aca.sa.gov.au, Section: Road 3, path 16E, site 18. This gives a death date of 24 Dec but in these older records this seems to be the burial date. [S365] CD - Sth Australian Births, Sth Aust Index of Births 1842-1906, Book 7, pg128. [S190] Index - GRO and Office of National Statistics, England & Wales Civil Registration Qtrly Indexes, Death: District of Shoreditch, Vol 2, p278, 3Q1840, aged 15 mths. [S414] CD - Sth Australian Marriages, Sth Aust Index of Marriages 1842-1916, Book 73, p351. [S1006] Will - Thomas Forsaith. [S366] CD - Sth Australian Deaths, Sth Aust Index of Deaths 1842-1915, Book 284, p455. [S371] Public Record Office, Victoria, at http://www.prov.vic.gov.au, Wills and probate records, ref no 83/309. [S371] Public Record Office, Victoria, at http://www.prov.vic.gov.au, Wills and probate records, ref no 83/309 (Victorian probate also required on this Sth Australian estate as there were some shares held in a Victorian company). [S365] CD - Sth Australian Births, Sth Aust Index of Births 1842-1906, Book 84, p93. [S365] CD - Sth Australian Births, Sth Aust Index of Births 1842-1906, Book 93, p26. [S365] CD - Sth Australian Births, Sth Aust Index of Births 1842-1906, Book 119, p259. [S365] CD - Sth Australian Births, Sth Aust Index of Births 1842-1906, Book 155, p128. [S365] CD - Sth Australian Births, Sth Aust Index of Births 1842-1906, Book 175, p220. [S116] Census - 3 Apr 1881, UK Census, ED 43 RG11-0647 Folio 35 p37 FHL film 1341149 gives birthplace as Dalston which conflicts with all other sources. [S340] Census - 7 Apr 1861, UK census, ED 26 RG9-161 Folio 70 p26 GSU roll 542584, although 1851 census gives birthplace as Hackney. [S677] Index - England High Court of Justice, England & Wales National Probate Calendar, probate granted in London to Elizabeth Annie FORSAITH, widow and Thomas Edward FORSAITH, mercantile-clerk. [S677] Index - England High Court of Justice, England & Wales National Probate Calendar, probate granted in London to Thomas Edward FORSAITH, mercantile clerk and Herbert Charles FORSAITH, bank official. [S190] Index - GRO and Office of National Statistics, England & Wales Civil Registration Qtrly Indexes, Death: District of Richmond, Vol 2a, p595. [S677] Index - England High Court of Justice, England & Wales National Probate Calendar, This entry gives a death date of 8 Aug 1927 (after probate was granted!) so is clearly wrong. [S677] Index - England High Court of Justice, England & Wales National Probate Calendar, probate granted in London to Dorothy Forsaith and Janet Louisa Forsaith, spinsters. [S872] Census - 31 Mar 1901, Canada census, Crane Lake, Assiniboia (west/ouest), The Territories, Dist. No. 204, sub-district N, Family 60, p4. [S873] Census - 1 Jun 1911, Canada census, Moosejaw, Dist. No. 211, Sub-district 102, Family 110, p7. [S1054] National Archives - Canadian archives, Personnel Records of First World War, RG 150, Accession 1992-93/166, Box 3207 - 20, item no. 401492 (CEF). [S6] Newspaper - Times of London, edition of 19 Jun 1915, p.6, col E.
[S418] Ancestry.com - misc sources, at http://www.ancestry.com/, Canadian Passenger Lists, 1865–1935. Microfilm roll T-4831 Library and Archives, Department of Employment and Immigration Library and Archives Canada; Ottawa, Ontario, Canada.